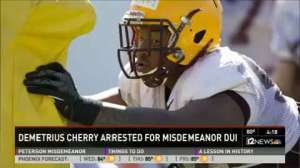 Demetrius Cherry, Defensive End for Arizona State, Arrested for DUI – Are Football Players Really Prone to More DUIs than the Rest Of Us? Los Angeles DUI blogs like this one are inevitably attracted to stories about celebrity DUI arrests. But is our coverage biased? Do NFL players, for instance, get arrested for crimes like DUI at unsually high rates? Over the weekend, police in Tempe Arizona arrested Demetrius Cherry, a junior defensive end for Arizona State. According to reports, police stopped him at South McAllister Avenue and University Drive at around 1:46 in the morning. Details of the arrest – such as what his blood alcohol concentration allegedly was and why police stopped him in the first place – have not been made public. Cherry’s coach suspended him from Saturday’s game against Utah. The arrest stimulates interesting thinking about the relevance of NFL and collegiate football DUIs to the national conversation about DUI. News agencies and blogs like this one seem to constantly be discussing NFL and collegiate football DUIs, because they’re often in the news, and because people tend to be curious when celebrities mess up. However, just because such stories appear in the news frequently does not necessarily mean that NFL players, on average, break DUI driving laws more frequently than average citizens do. The problem is an availability bias. Since we constantly see news stories about football players getting arrested for DUI, we tend to think that DUI must be epidemic among them. But what’s really epidemic is the COVERAGE of these arrests. When an IT worker drives while over the legal limit, and police pull him over an hour later and test him to have a blood alcohol concentration of 0.12 percent (one and half times the California legal limit), that story will not make the news… unless of course the IT worker does something extraordinary, like kill someone or make a ridiculous comment to the police. But when a NFL player is busted for DUI, for any reason, it’s news. For help understanding your legal situation, turn to an experienced Los Angeles DUI defense lawyer with the Kraut Law Group. Schedule a free consultation with a former Deputy District Attorney (high-level prosecutor) about your case.